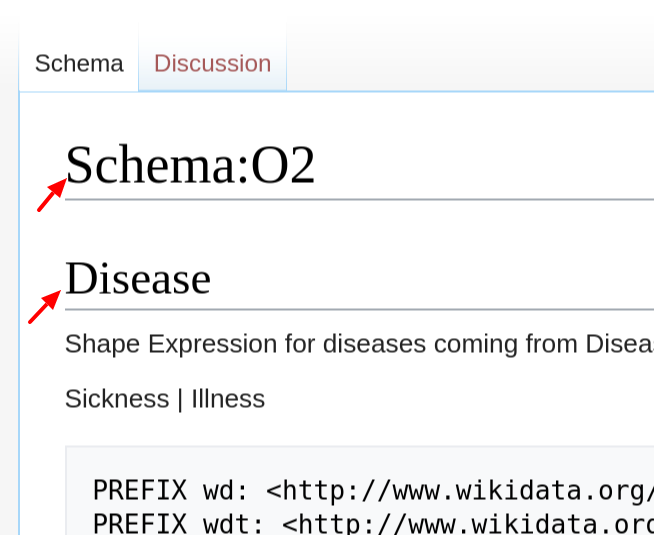 Right now it looks like the Schema page has two headings, one saying "Schema:Oxxx" and one with the Label. They should be combined into one like on Item pages. 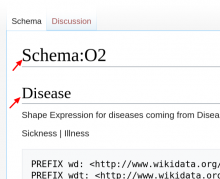 The resulting header is "Label (Oxxx)". Only one heading remains with both the Label and the ID. The styling is the same as on Item and Property pages. Message when no label is available: "No Label defined"
Lydia_Pintscher moved this task from Backlog to Ready to pick up on the Shape Expressions board. Lucas_Werkmeister_WMDE edited projects, added Shape Expressions Sprint 4; removed Shape Expressions. Lucas_Werkmeister_WMDE moved this task from Backlog to Doing on the Shape Expressions Sprint 4 board. Also, this doesn’t use language fallbacks yet – should it? Move back to doing, as per @Lucas_Werkmeister_WMDE's comment. Lea_Lacroix_WMDE moved this task from Verification to Done on the Shape Expressions Sprint 4 board.